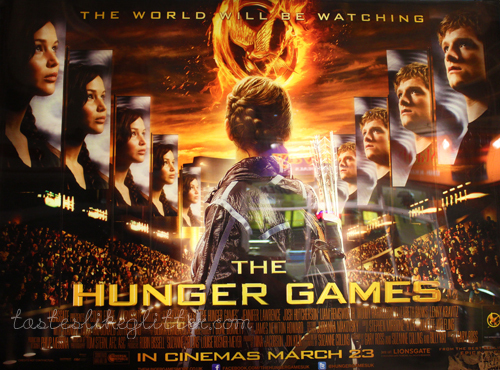 Probably the most anticipated movie of this year - The Hunger Games. I started reading these towards the end of last year and I was super excited about the release, even more so when I got an advanced screening! If you don't know what it's about, where have you been hiding? In a word, kids killing kids for rich peoples entertainment. I have no idea how this is still being marketed for children. I wouldn't let them watch or read about this, especially since the second book is quite a lot more graphic. I understand people dislike actors, I mean I hated Clove. I hated her in 'The Orphan' and I was pretty gutted when I found out she was in this but eh. The choice of actors in this movie caused quite a stir on Twitter especially and not in a good way. For real? 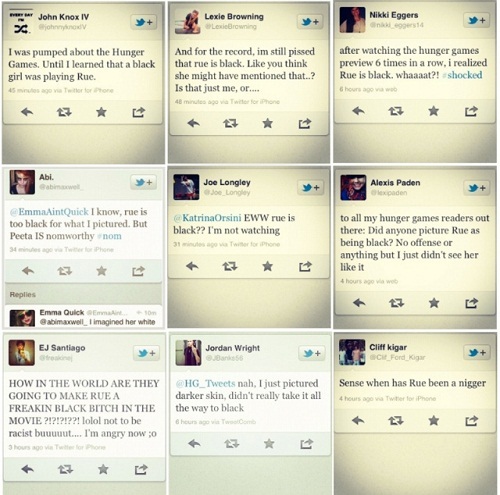 There was hundreds upon hundreds of tweets directing racism towards a 13 year old girl. So what did I think of the film? Personally I loved it. Suzanne Collins actually helped write the book to film adaptation of the script. So I think the bits that were missed out (bar the pin) she didn't feel were important. For me, films from books have always been ruined for me but this was pretty close in it's entirety. It had the third biggest opening of all time, falling behind Harry Potter & The Deathly Hallows Part 2 and The Dark Knight, both of which have previous movies behind them. I shall be looking forward November 22 2013, when Catching Fire shall be released. Hopefully it isn't delayed because of Gary Ross choosing not to direct the second film. Serious book and film comparisons/spoilers after the cut. Don't blame me if it ruins it for you, you've been warned. At the start of the film the mine workers are seen going to work but in the book everyone has the Reaping day off, everything is shut. Most notably the Mockingjay pin. I absolutely hate hate hate how Katniss acquires this in the film. I think the book is a much nicer way of receiving it. At the reaping Haymitch drunkenly falls off the stage. He wasn't present at the ceremony but it would have been funny to see. Prim gives Katniss back the Mockingjay pin when she sees her for the last time after the reaping. Instead of it being giving her to by Madge. In the film you don't see Madge (obviously since she isn't in the film at all) or Peeta's Dad go and see Katniss after the reaping. Lack of Avox girl in the Capitol. Katniss briefly sees her when she is served before she's prepped for The Games. She has an interesting back story and Katniss remembers her as a girl who tried to escape the Capitol. As the movie isn't from Katniss' point of view, you don't find this out. The Cornucopia is described as a gold horn in the book. The film sees it as a much more squashed, steel wreck. In the books the dead bodies were removed by hovercraft. In the film this isn't shown, which I believe helps it get the 12A rating. In the book Katniss loses hearing in one ear and after the Games the Capitol fix this for her. In the film she only temporarily loses hearing. In the book District 11 give bread in thanks for what Katniss did to Rue. In the film the rebellions start early instead. These don't happen till the second books. But whilst it is a vast difference it sets up the events that will happen later on. In the book Peeta has to have his leg amputated before they return home. In the film this doesn't occur. It's not obvious in the film that Katniss and Peeta are pretending to be in love, though Peeta's feelings are true, to gain sponsors. The end of Seneca Crane. He hangs himself but this isn't revealed until Catching Fire where there's a key scene when Katniss is with the Game Makers that largely relates to this. In the film he's left in a room with just a bowl of deadly nightlock berries.